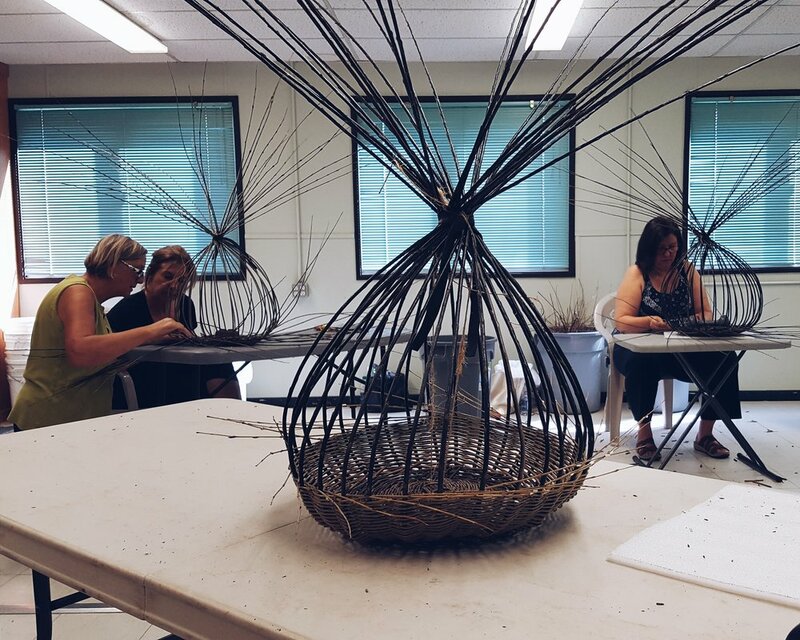 Shortly after my first willow basket class in NC, I was lucky enough to get a spot in a class with Lene of Lakeshore Willows. So far I have visited her in Canada, twice. The first time was for a round basket class, and the second I spent two days learning brand new techniques with her and another amazing basket maker named, Anna Mette. I have been extremely lucky to meet and learn with these two ladies. I sincerely hope that each year I can return for more classes and continue to improve my skills with willow. I can't say this was my first time in Canada, but it was my first time really getting to experience it. Years ago I traveled to Vancouver to get on a cruise to Alaska, but that wasn't anything like my experience in Ontario. I drove through New York State, past the border over the Peace Bridge, and into a place very different then I was expecting. Lene lives very close to Lake Erie. A short drive down the road brings you right to the shores of the lake. One day I took a short walk, and saw the most beautiful pieces of driftwood all over the rocky shoreline. I grabbed a few and hid them in the back of my car. It was to my greatest delight to discover that the basket we were making could include a handle of our choosing. I was excited to use one of the pieces I found, which just made this basket even more memorable to me. I have been constantly amazed at the amount of time that has to go into a willow basket. After a few years of working with only reeds, I had grown accustomed to a quick turn around time. 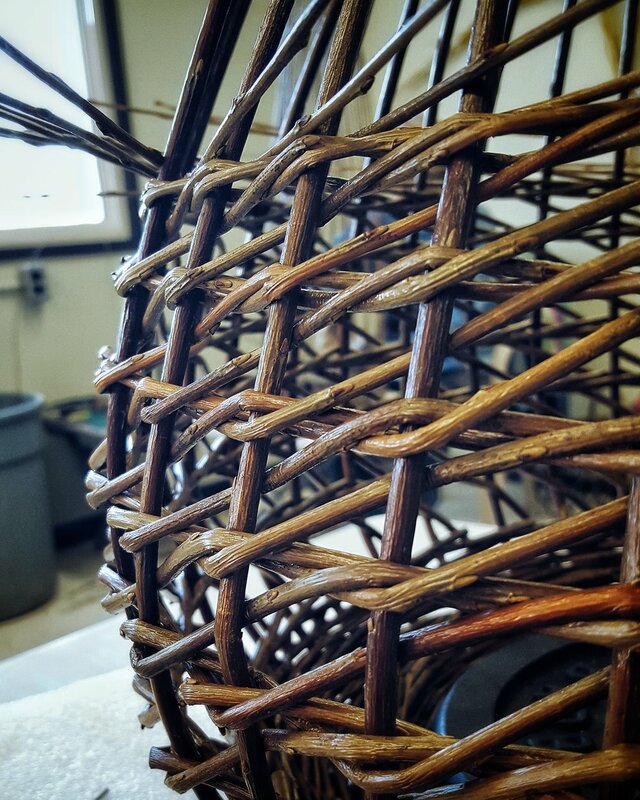 I can make a reed basket in two hours, but willow baskets can take up to two days! Wow! But every time I work with willow, I fall in love all over again. It really is the most gorgeous medium to work with. You can feel the life of the plant as you work it into shape. It bends and moves in the most remarkable way. One of the awesome things about working with Lene, is that she grows many varieties of willow on her farm. The colors that you see on the baskets are all natural. Below is a small look at of some of Lene's willow beds. Willow for baskets are planted in rows like a crop would be. Every winter the rods are cut down and sorted by length. This truly was an amazing thing to see. 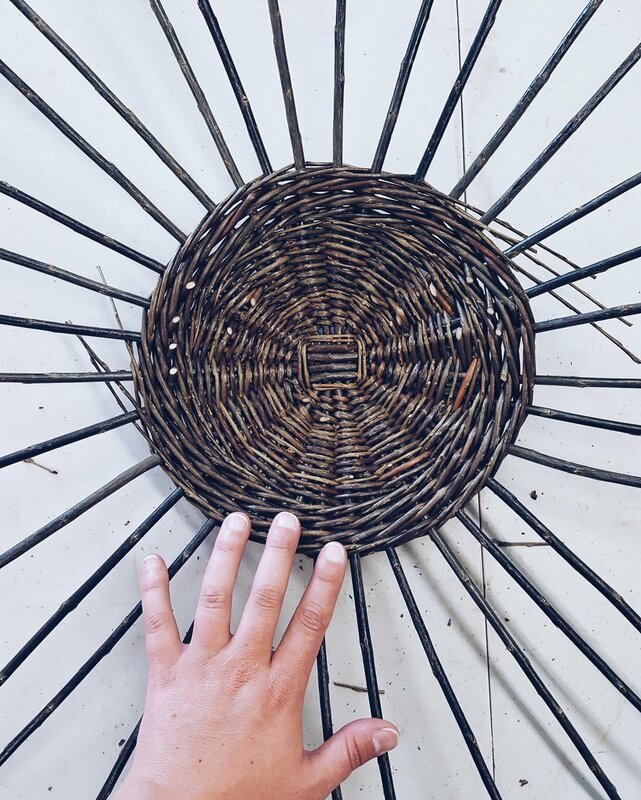 I can honestly say that after visiting Lene and seeing how possible it would be to grow willow for basket making, my mind was definitely racing. It only compounded my interested and excitement about learning as much as I can and finding a place to start growing my own. Below are the two baskets I made during my second trip to Lene's Farm. She hosted another basket maker from Denmark named, Anna Mette. Her work is beyond gorgeous, and she is a extremely talented artist and photographer. The two days that I got to spend with Anna Mette we were also working on round baskets. The first one I made was with an Irish weave and the second one was a rope coil. These new techniques allowed me to work within the round types to enforce the skills I had learned previously. It was an amazing opportunity to meet and work with Anna Mette, and I hope to take classes with her again. Overall I'm so happy to have found Lene at Lakeshore Willows. And I'm even more excited to learn that there is a growing community of willow basket makers not far from me at all. Lene holds many classes throughout the year, and I'm looking forward to taking advantage of many more learning opportunities in the future. My second trip to Canada I also got to do a little sight seeing. I finally got to see Niagara Falls. It was a beautiful day and I'm glad I took the time to explore a little more. This summer coming up I'm happy to say that I'll be back to Lene's again to work with yet another basket maker named, Steen Madsen. And a second trip to a different willow farm in Canada is also set for later this summer, and I'll be sure to write about that as well!